One of the biggest questions parents have about test prep is what test their student should take and when to begin to prepare for it. To optimize scores, students should prepare for and take either the SAT or ACT, not both. Every college in America now accepts both tests. 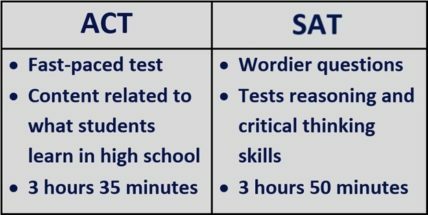 Most students take the SAT or ACT in the spring of their junior year, and if necessary, in the fall of their senior year. Contact us to determine which test is right for your student. Below you’ll find the test dates, the registration deadlines, and recommendation to begin the test prep process (typically three and a half months out). Register for the SAT here. Register for the ACT here.